12/2/18: How Far Will the Court Go to Remedy Our Housing Impasse? 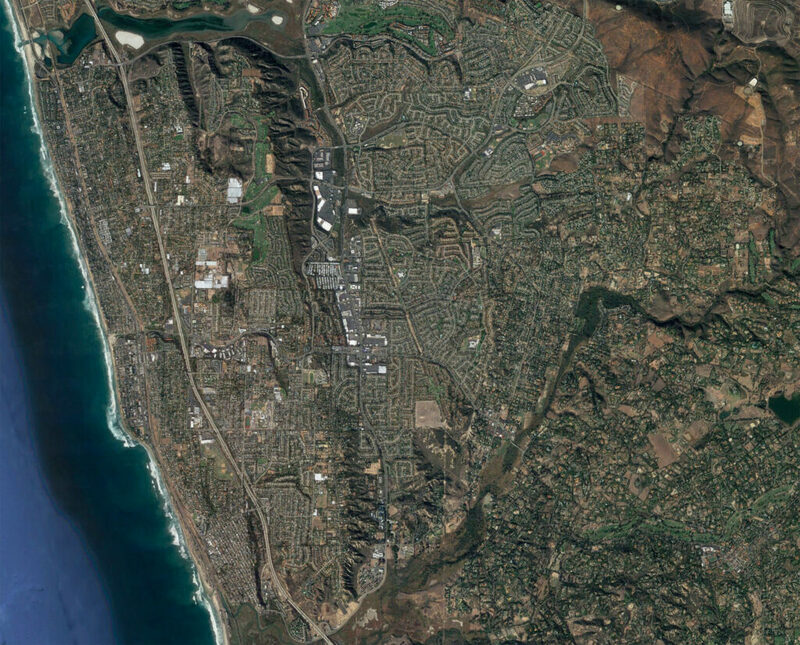 Once again, housing dominated this week’s biggest news in Encinitas. Last Wednesday, in a courtroom packed with more than 50 people, Superior Court Judge Ronald Frazier indicated that the city’s days without a plan for future housing are numbered. 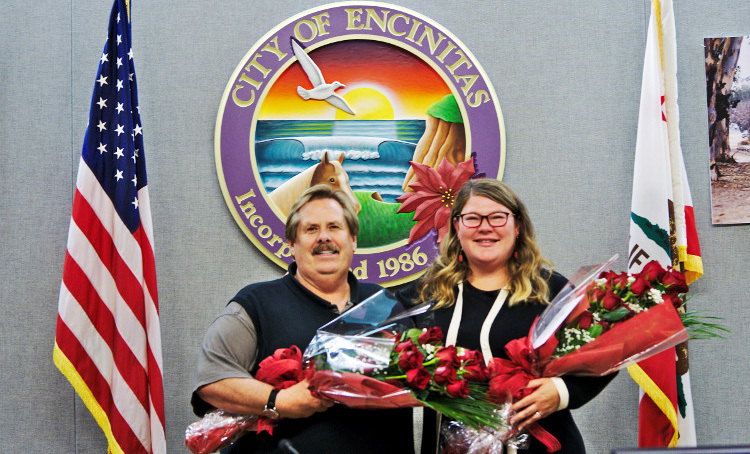 Judge Frazier’s final written decision on what Encinitas must do to comply with state housing law will be released on Dec. 12. That’s one day after the final election results are certified that confirm that our last housing plan, Measure U, failed at the ballot box last month. One of the issues he appeared to be wrestling with is the extent of what he termed “limited preemption.” Preemption is the idea that state laws override city ordinances when the two are in conflict. In our case, state housing laws which require more housing preempt our local growth control measure, known as Prop. A, that requires upzoning to be approved by a vote of the people. What remained unclear from the hearing is the extent of the possible preemption. It almost certainly appeared that it would apply to the housing plan in this housing cycle – we’re six years into the current eight-year cycle with two failed attempts. But immediately after this cycle ends, a new one begins, during which state law stipulates that we’ll have to zone for even more housing. Whether that new plan will require a public vote remains to be seen. My feeling remains that, in our two attempts, the city worked in good faith with tremendous dedication of time and resources to develop a housing plan that both met the state’s requirements and addressed community concerns about design standards and site selections. Both the first and second process were intensive, divisive, emotional, and required sometimes painful compromise. Both the judge and the parties in court repeatedly referred to our situation as an “impasse.” Now it will be resolved by the court, and we’ll learn the extent of the “limited preemption” on December 12. Here are news stories about the court’s decision from the San Diego Union-Tribune, the Coast News, and the Voice of San Diego. 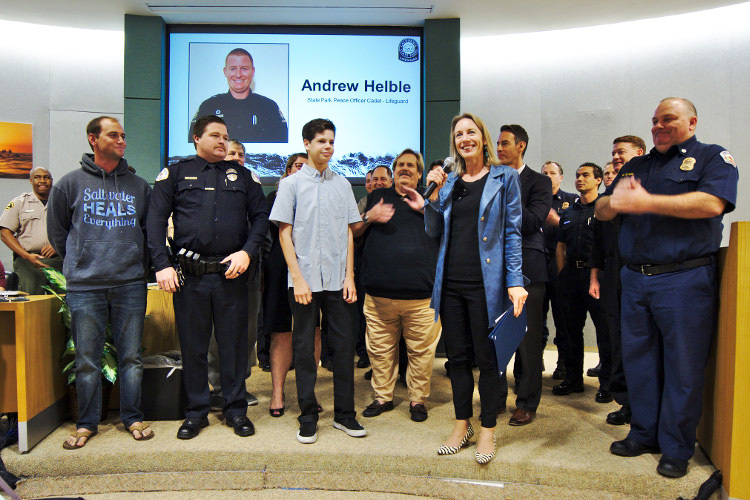 At our City Council meeting, I was pleased and honored to present a Mayor’s Certificate of Bravery to the teen attacked by a Great White shark at Beacon’s Beach last September, as well as three Encinitas Proclamations to the good samaritans who risked their own safety to help him – boater Chad Hammel, Oceanside Police Officer Matthew Ephron and off-duty lifeguard Andrew Helble. 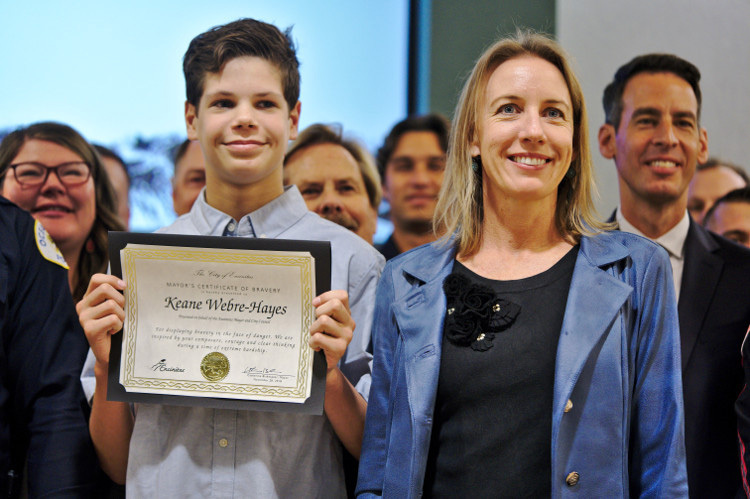 These rescuers didn’t flee or panic when the shark that had just bitten Keane Webre-Hayes was trailing them. Their emergency training and instincts kicked in and they focused on supporting Keane and getting him safely to shore. And when they got to shore, a whole team of people from many agencies (see all the first responders in the photo) assured him the highest level of care. Fate brought all these folks together. And the result was the best that could be hoped for, given the grim odds during a shark attack. 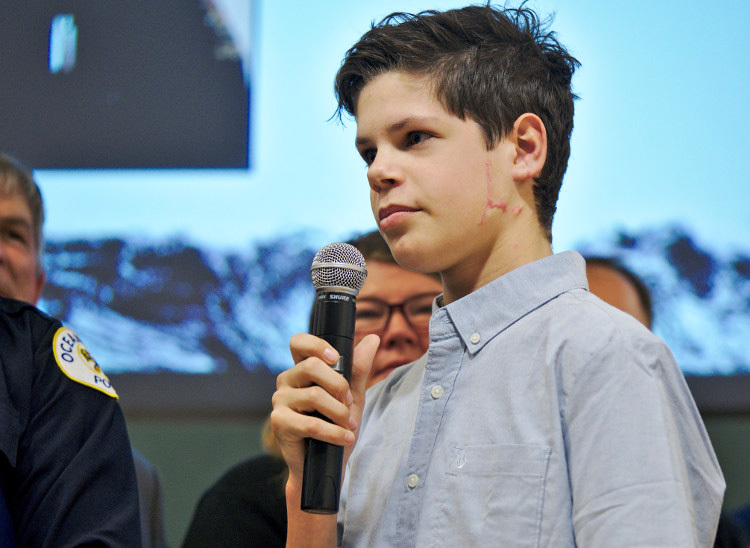 Read and watch stories about the presentation in the Coast News, the Encinitas Advocate, NBC 7 News, 10 News, Fox 5 News, and News 8. 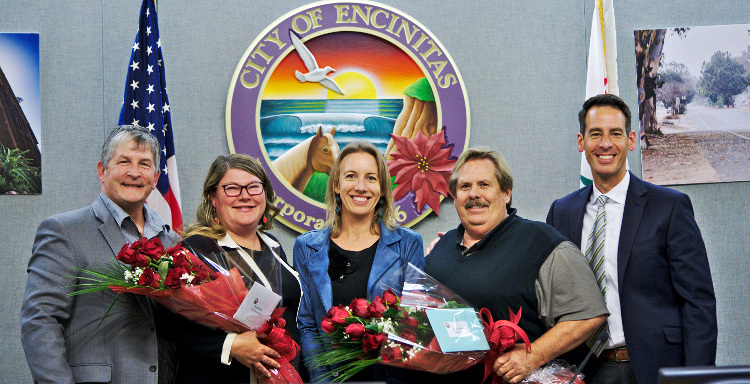 We honored outgoing City Councilmembers Tasha Boerner Horvath and Mark Muir at their final meeting Wednesday. I’m really going to miss the cohesion and team spirit that the five of us had. For two years, this group of five has worked together to tackle our housing problems, marijuana regulations, debates about public improvements like Leucadia Streetscape, and a plethora of other issues. Tasha has been elected to represent us in California’s 76th Assembly District, and Mark says he’s retiring but will remain active in the community. With great appreciation, we wish them both the very best! We received the financial results from the fiscal year 2017-18, which showed a general fund balance carryover of $4.3 million. Of this amount, we allotted an additional $500,000 to pre-pay unfunded pension liability and $500,000 to our open space acquisition fund. Plans for the remainder of the surplus will be discussed at our strategic planning session in March. I’m on the lookout for a good book about California’s political history over the last century. If you’re a regular reader of this newsletter, you may have read the occasional reference or quote to our American history (an interest of mine that was kicked into high gear by the Hamilton biography, soundtrack, and Broadway show). Now I’d like to acquire more depth of knowledge about the forces that have created the current political reality in our state. So if you have a suggestion about a well-written and informative book about California’s political history, I’d love to hear about it! I’ll be taking a break from writing the newsletter next week, but will return to your inbox on Dec. 16. If you can join us on for the inauguration ceremony for Councilmember Joe Mosca, Councilmember-elect Jody Hubbard and me at City Hall on December 11, we’d love to see you there. I hope you’ve enjoyed our rare rain and cooler winter weather! Previous Post11/25/18: Turkey Bones and Backyard Homes Build Our Future!Next Post12/16/18: It’s Time to Make Our Encinitas Streets Safer!